Tribe | HyTensil | Clean. Sharp. Progressive. HyTensil brings a military-level of hygiene to the outdoor utensil market. Positioning this neatly combined knife, fork and spoon as ‘The cleanest, safest way to eat on the go’, we created a simple and confident new brand and website to occupy the unique space this innovative product warrants. The key to finding a strong product name is in finding the sweetspot between something unique, memorable, relevant and evocative. By creating a portmanteau (a word formed by combining two different terms to create a new entity) we focused on the stand-out unique feature that forms the positioning of the product, combined with its descriptive category. Both the brand identity and the website experience reflected the clean, sharp, hygienic properties of HyTensil. In providing an engaging platform for launch, we based our approach on a few core principles. Giving the product a strong personality and highlighting its genuine points of difference, we adopted strong design elements such as clean-cut illustrations, high contrast colour combinations and a slide-and-click animation to replicate the HyTensil functionality. Clean keylines and the neutral modernism of the typeface communicate technological precision and hygienic innovation. Contrasted with bold, vibrant colour, the identity is supported with a warmth and energy that feels innovative, strong and stylish. The + that builds out from the crossbar of the H in the logotype forms a simple graphic signpost to the inherent antibacterial properties of the product. An identity that feels clean, safe, simple and stylish. We translated HyTensil’s inherent simplicity to the website. This combined a minimal structure with a full ecommerce experience, keeping information and purchase facility up front. This minimised the frustrations of slow loading pages, content distractions and deviations in the customer journey. 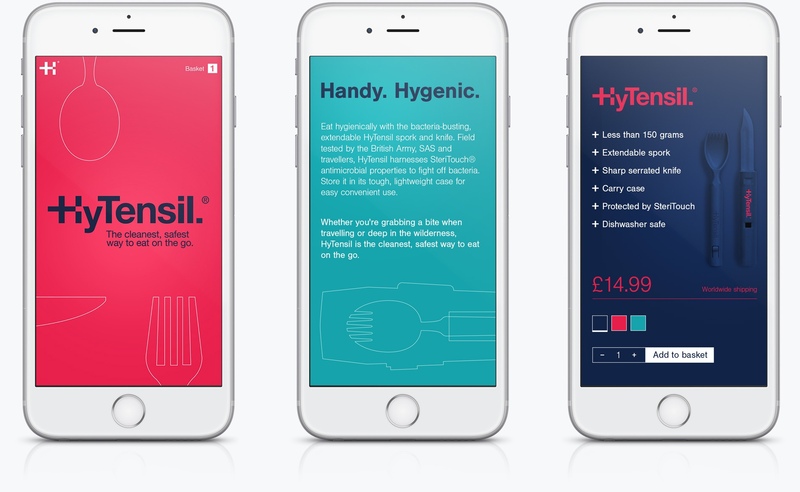 To provide a satisfying experience in line with the HyTensil experience – we included smooth and snappy scrolling, off-screen navigation menu, illustration animation and a seamless basket functionality.